The use of passive solar power represents an important strategy for displacing traditional energy sources in buildings. Basically, passive solar heating is when opportunities are made for the sun to shine into a building to warm it up. The walls and floors are made with materials that absorb and store the sun's heat. They heat up during the day and release the heat at night. Technologies that use a significant amount of conventional energy to power pumps or fans are active solar energy technologies. The term "passive" implies that no additional mechanical equipment is used - other than the normal building elements. Some passive systems use small amounts of conventional energy to control dampers, shutters and other devices that enhance passive solar energy collection and storage, and reduce undesirable heat transfer. All solar gains are brought in through windows. The most efficient window orientation for heat gain is due south, but any variation within 30 degrees of due south is acceptable. In the southern hemisphere the reverse is true - windows face due north. The inside of the buildings are also well lit and further reduce the use of electricity. Heating costs can be more than half of those for a building requiring electrical or other heating. A ratio of roughly 8% window to floor area is recommended for south facing walls if you are in the northern hemisphere or north facing walls in the southern hemisphere. Although this ratio may seem small, it is important to note that it comes from the floor area, which is much larger than the wall area. The prevention of overheating presents one of the biggest challenges when using passive solar power. 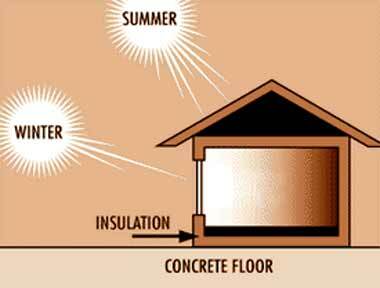 A technique to control overheating - and extend warm conditions once the sun is down - is to use heavy mass materials in the walls and floors. Tile or stone on floors in a mortar bed, and brick or double layers of gypsum board on the walls, will absorb solar radiation, smooth out the peaks of solar gain, and slowly radiate heat back into the room when the sun is gone. The passive solar power term of "day-lighting" refers to using the overall light of the surrounding sky to illuminate building spaces, not just direct sunlight. A good day-lighting system will embrace the following elements - the orientation of the spaces to be lit - location, shape and dimensions of the opening through which the daylight will travel - the location of internal surfaces which may reflect the daylight - and also the location of items which provide protection from to much light or glare. Passive solar systems have little to no operating costs, often have low maintenance costs, and emit no greenhouse gases in operation. When combined with active solar technologies or photovoltaics, even higher conventional energy savings can be achieved. 'Low-grade' energy needs such as space and water heating, have proven to be better applications for passive solar power. And the final use of passive solar power which we will discuss is solar cooking. Solar cooking is simply using the available heat in the suns rays to heat a solar oven and cook food. Click here to read more on cooking with solar ovens and solar cookers.